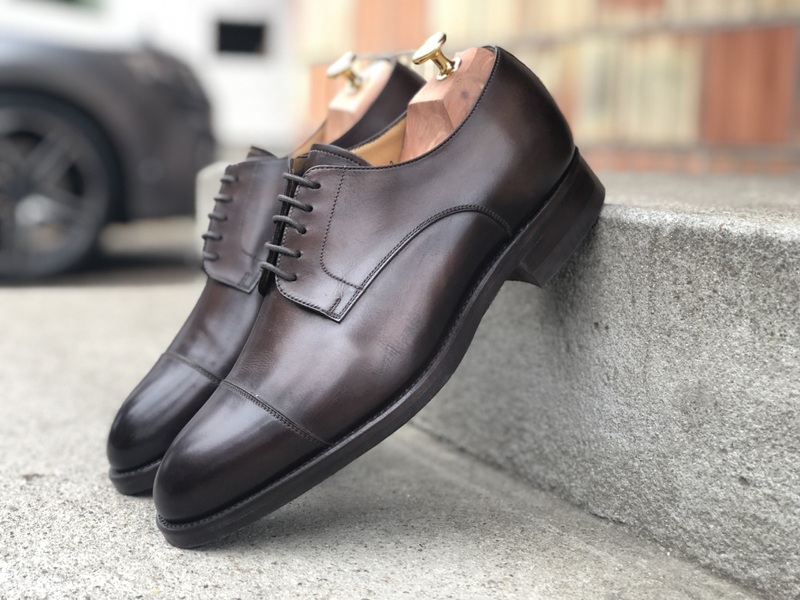 I recently wrote this great article about the Best Men’s Dress Shoe Brands in 2019. Carlos Santos was a clear recommendation under 400$ for multiple reasons. 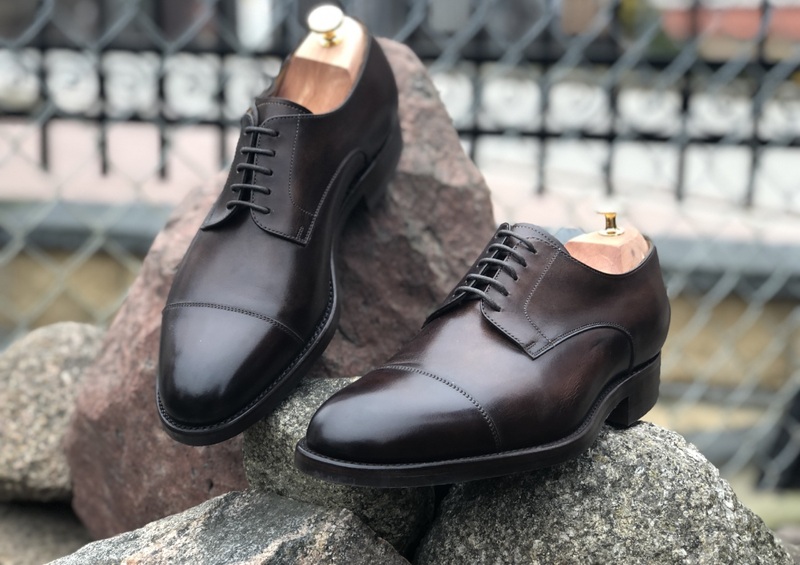 The quality of the leather, the craftsmanship and attention to detail coupled with the stunning unique patinas for a killer price are enough on their own to justify a purchase. For me however there is something much more important and personal. I have developed a wonderful relationship with the Brand as a customer, not just a blogger. It is a delight to talk to customer service and get a response by none other than Ana Santos, the daughter of the owner! It makes it so much more personal and little things like these improve the customer relations. Lastly, there is the history of a boy learning how to make shoes in 1942 and ending up owning the factory. 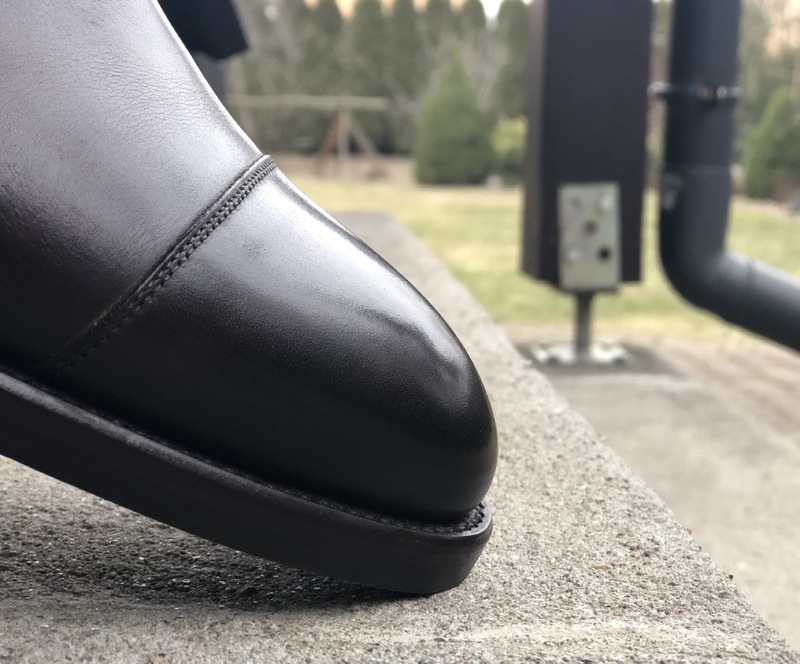 I would advise reading my original Double Monk-Straps Review to learn more about their history and background. As aforementioned, I made my purchase on Pediwear, which is a family business selling some of the best shoes since 1976 in the UK. Browsing and checking out is super easy and they have also a great policy not to charge your purchase until it gets dispatched. In this case, due to the Patina Service taking 3-5 weeks I was not charged immediately, something which is great for you that love budgeting. The delivery time was lightning fast actually! It took just a little over half a day for my package to arrive through DHL in Sweden. It must have been the fastest processing and delivery I have had so far from the UK. The best part about my experience with Pediwear however was the lovely customer service and the beautiful hand-written note reassuring me that my shoes passed quality control and were in good condition. Thank you very much Anita! In my opinion, more expensive items should be accompanied by higher quality presentation and packaging. You would not feel great spending 400$ on a pair of shoes only to find out a plastic box with nothing else inside right? Thankfully, Carlos Santos has some of the better unboxing experiences especially considering the price. From the beautiful logo on the top, to the strong sturdy box, everything checks out. There is a lovely houndstooth pattern under the cap, with a few words by Carlos Santos. Everything is neatly packaged with some thin paper and foam for protection. The classic shoe horn is omnipresent as usual as well as the dust bags and leaflet explaining the Goodyear Welt System. If you have read my previous reviews you might know already, but this was my first purchase from Pediwear and I did mention it comes with a surprise. The handwritten letter confirming inspection of my shoes and delivery is an excellent way to build rapport and good customer relations. Many companies could benefit from such a simple addition! In general, the Carlos Santos box ensures your shoes will arrive safely and come with all the necessary utilities, plus a little extra. There is nothing like the feeling you get when opening a new box and smelling the leather. Like with my previous purchases, the shoes came out of the box with a high shine and polish. You could put them up on display in a museum or a shoe shining contest. Everything fits well in the box and your shoes will be well protected during and after transport. The smell is wonderful and not synthetic. It gives you a feeling of a luxurious product which is what you expect from pricey items. The first thing you should always do is check for defects, blemishes or problems. In this case everything was great, from the color of the patina, to the stitching of the welt. Pediwear checks it for quality, but it is always good to have a second look. 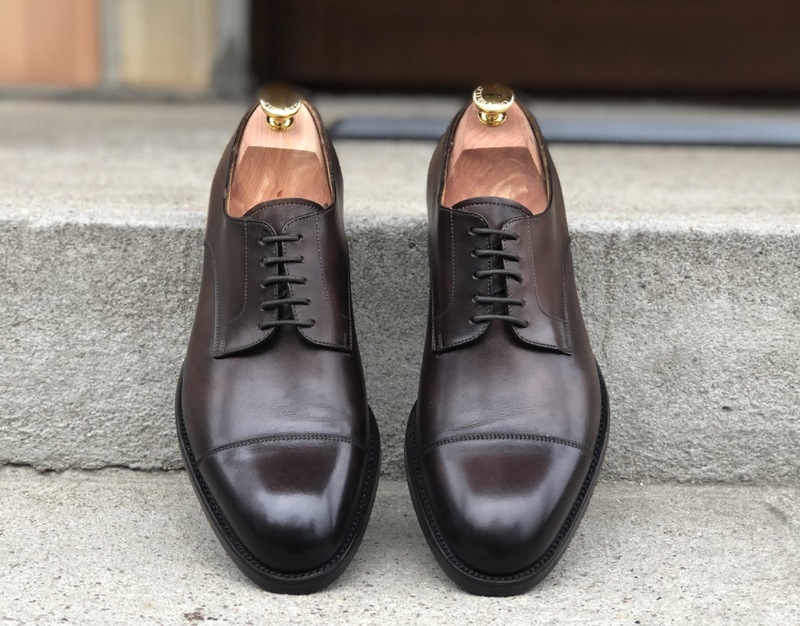 Reminder: These are Patina Shoes, handpainted to create a unique finish for every shoe. Potential irregularities in the coloring are NOT mistakes and add to the character of your shoes. 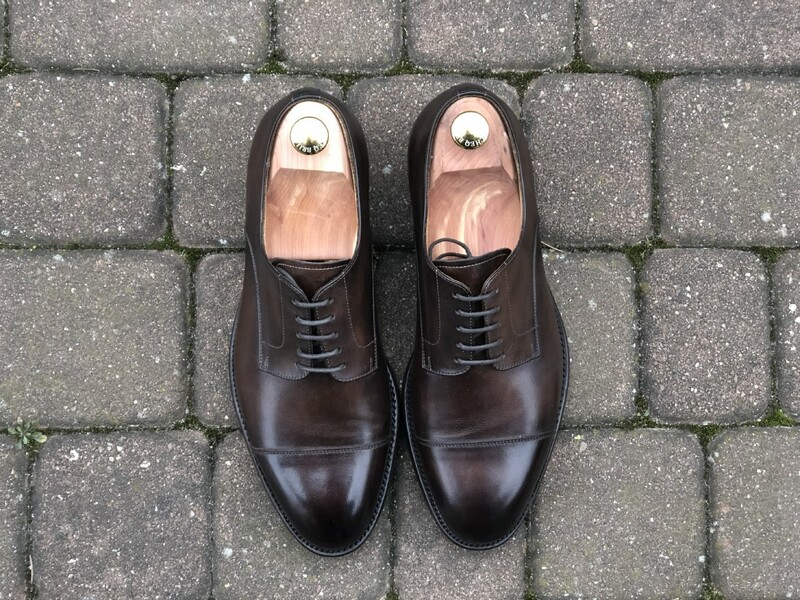 Carlos Santos offers two distinct styles of Derby Shoes. One is the more traditional model like today’s review, but there is also a more unique 3 eyelet version (Style 7201) where the stitching and facing are quite different. However, today’s model by Carlos Santos is the 9381 Cap-Toe Derby. You can choose from many beautiful colors through the Patina program, from deep burgundy, to blue and violet. Coimbra is the dark brown version and the closest to black but also the name of a city in Portugal. A little bit of trivia for you all. Immediately it is obvious how dashing the color is. You look at it from every angle and it changes color depending on how the light hits it. The Cap-Toe is classic and burnished to a more dark color which is borderline black. There is no “broguing” on this model so it sits higher in the formality scale. The 5 eyelets are punched in without brass, giving the shoe a cleaner look. The laces are also dark and very robust, creating a very uniform look. As for the facing, it has a hockey stick vibe to it, quite similar to the Lace-Up Boots. Stitching of the uppers is mostly discreet but more visible on the vamp and Cap-Toe. The backseam is straight, a change from the Monk-Straps that have a “dog-tail” sewing. Lastly, the welt and sole stitching is clean combined with a dainite sole. I chose this style due to the harsh conditions on Swedish roads and quite honestly nobody can tell the difference. The Goodyear Welt System ensures the sole can be replaced and last for years to come. For those that are looking for a classic Cap-Toe Derby, the 9381 by Carlos Santos in Coimbra is an excellent choice. A classic Derby shoe with Mediterranean flair worthy of a 9.5/10 because the enemy of good is better! Since I already own a pair of Carlos Santos on the 234 Last it was easy to choose size. Skoaktiebolaget’s advice is to pick TTS (True-To-Size) but to size down 1 full size from your regular US number. As with suits, fit is the most important aspect of shoes. What good is a great looking shoe if it causes blisters on every use? In my case, the size is UK 7, which gives me a snug yet comfortable fit with any type of socks. The width is regular and that is good news for those with normal feet, but might be too tight for those with wider. 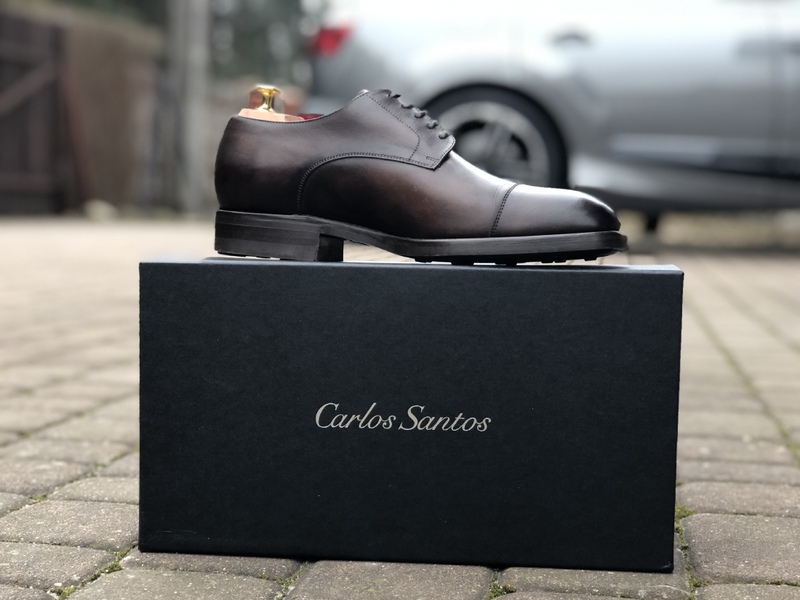 In general you can find Carlos Santos shoes from UK 6 – UK 11. The Santos 9381 Derby on the 234 last fits me great but if you are uncertain you should always contact support. Carlos Santos on Instagram tends to be very responsive and so is Pediwear’s customer service. If I had to give a grade, it would be again a 9.5/10 since I know exactly my fit, there is enough information online but there is a lack of support for different widths. In continuation from the previous section, the shoes are very comfortable. My first wear was in Poland, walking through the streets of Warsaw for a whole day. The leather is very soft and smooth and It never ceases to amaze me that the break-in period is so short. Just like the boots, I got minor heel pain after 6 hours of wear but it disappeared on the next wear. For me that is the sign of a quality shoe and construction. In general, the 234 last has a generous instep and good arch support. The toe has a soft-chiseled look for a sleeker “I mean business” look and thankfully has enough space for your toes. These combine with the rubber sole to create a very comfortable feel. Talking about the Dainite rubber sole, there is something very interesting about it. It has small round shapes, which for some reason remind me of the “suckers” on the tentacles of octopuses! When I walk on flat surfaces, I feel that the heel is slightly on a different level than the rest of the sole. Nothing to fuss about and definitely not a problem, but it was something I noticed. My second wear was in a traditional Polish wedding and I am glad I was wearing these bad boys. I must admit it can be a little challenging at times to loosen the laces and put them on. However, that stems from my fear of scratching or rough-treating the shoes. I feel a 9/10 is a great, honest grade in the comfort category for the Carlos Santos 9381 Cap-Toe Derby. Reminder: The grades are subject to my own opinions and experiences, it might differ from person to person. What more is there to say about Carlos Santos. Four pairs of shoes, all wonderfully made from the highest quality materials. Everything is handcrafted in Portugal in the Zarco factory. Unless I am mistaken, the leather is sourced from the French Tanneries Du Puy and D’Annonay. It is so much smoother than the stiff British leathers. 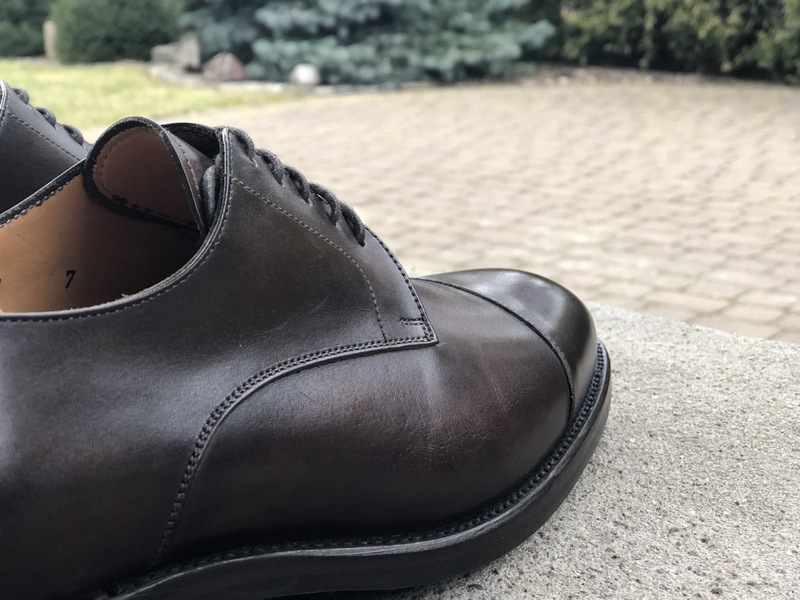 The Patina service is something that you do not encounter often in this price range and if you do, it is probably one of those lower quality internet shoes that you should avoid. I can only think of Septieme Largeur as style competitors. Once more, the rubber sole is a beast. It can take everything you throw at it. I walked for hours in Warsaw without a hitch and I look forward to wearing them in the cobbled streets of Stockholm. The Cap-Toe’s burnish is absolutely beautiful and the stitching perfect without any blemishes. The same goes for the welt/sole and the stitching of the uppers. The laces are strong and easy to manipulate and so is altering their length. The leather insole is quite comfortable and will hold up very well. 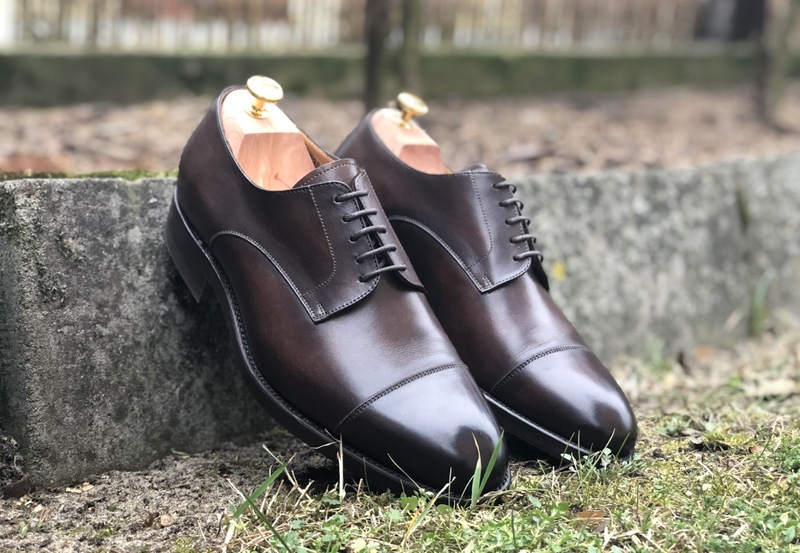 Due to the RTW nature of the shoes, the shoes are slightly roomy on the instep and this has caused a little premature creasing on the vamp, but it is not noticeable on everyday wear. 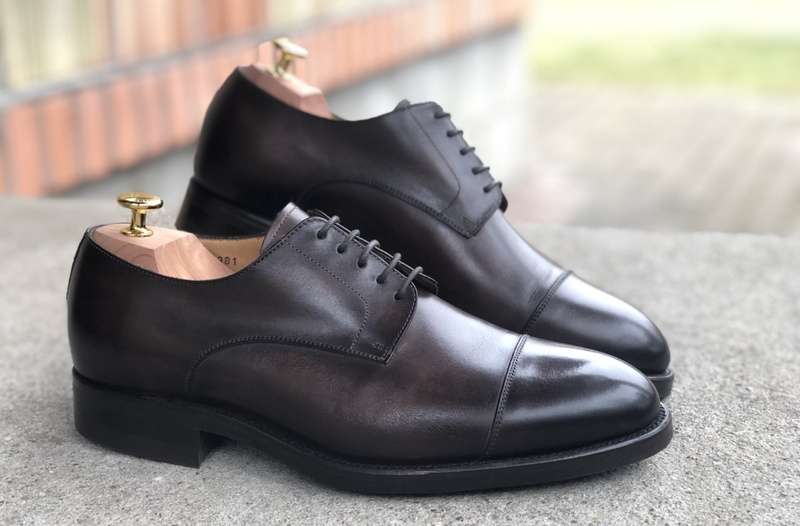 If you really want to nitpick, there are tiny, tiny inconsistencies such as areas of the heel that are not entirely level but you need to also consider the price point. I prefer to think of them as artistic expressions instead. I am very satisfied with these Derbies, enough to give them a 9/10. In Pediwear, the Carlos Santos 9381 Cap-Toe Derby Shoe will cost you about 375$ including tax. It is part of the Patina service and I would look out for the Winter Sales. 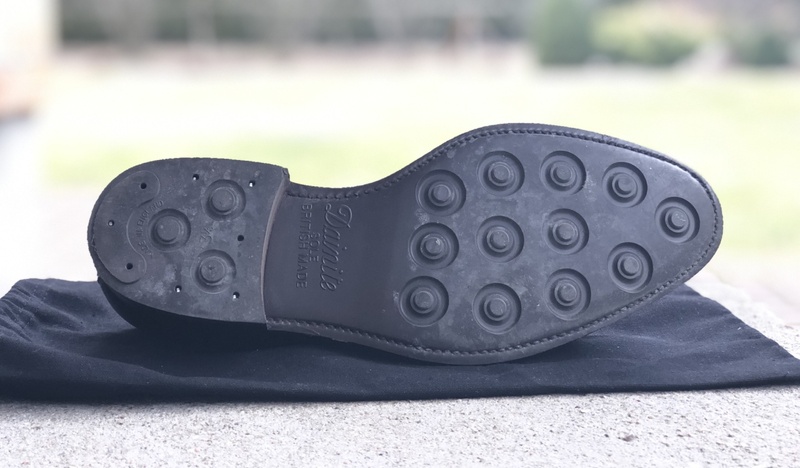 The great thing about Pediwear is that all Santos Shoes come with free shoe trees when not on discount. If you choose to support directly Carlos Santos, these will cost you slightly more at about 435$. These are on the Z397 last however so be careful. Availability is a weaker point of the Carlos Santos Brand outside of Europe. They have some retailers here and there, but your best bet would be to probably order through a trusted source such as Skoaktiebolaget or Pediwear for that matter. VAT should be automatically deducted from your order and if you have no issue dealing with customs, it is a great choice. This Sounds Great, But How Do I Wear Them? Ah, the beauty of a brown derby shoe. A dark brown, Cap-Toe Derby like this is such a versatile piece. It will look fantastic with a 3 piece navy suit or feel right at home with a pair of denim. Less formal than an oxford, it does not look out of place with chinos or jeans. This does not mean you should wear them with shorts or sweatpants though ok? Leave these abominations for the runway models of the fashion industry! You want to be stylish but not loud. Follow these rules and soon you will be the best looking (effortless) man in the room. 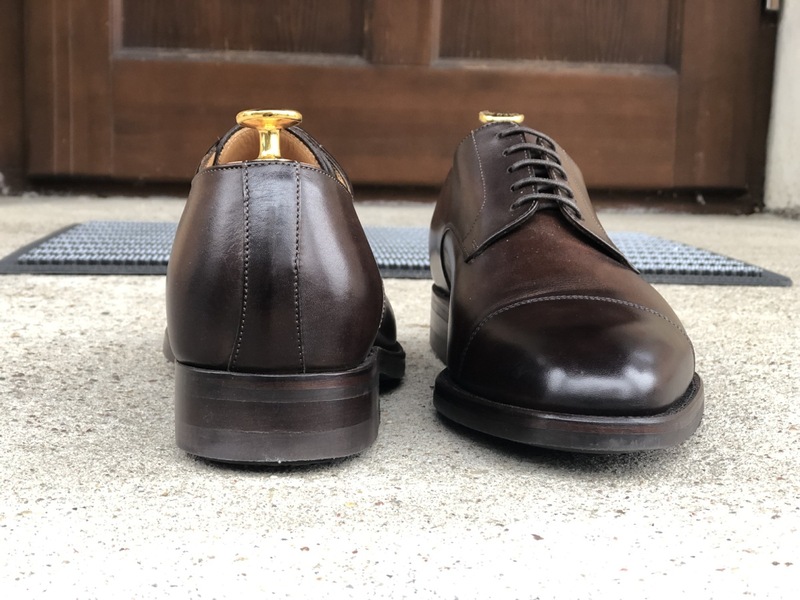 How On Earth Do I Take Care Of Patina Shoes? I get this question a lot! For inexperienced people I would suggest using a neutral shoe polish such as the Saphir Medaille D’Or Pommadier 1925. Always buff and clean with a good horsehair brush to maintain your shoes in the best possible condition. 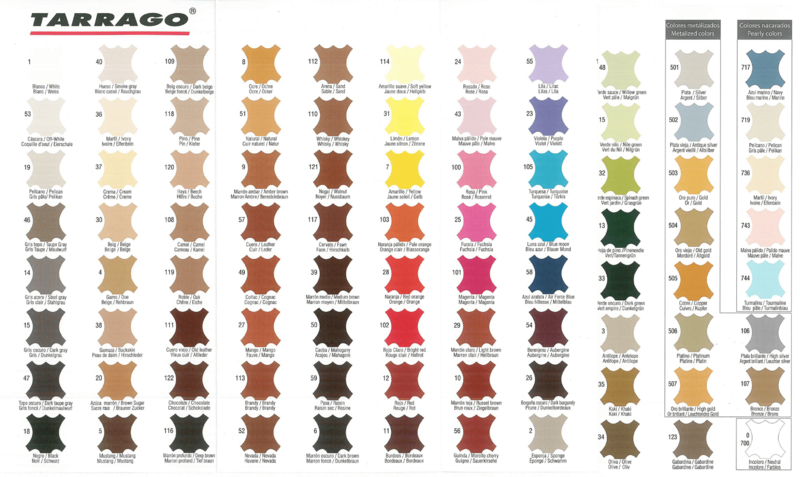 If you are more adventurous or have experience, I think this is a great guide on how to pick the correct color polish for your shoes. Reminder: Color Shoe Polishes can significantly change the appearance of your shoes. If you are unsure, stick with neutral or let a cobbler do it for you. 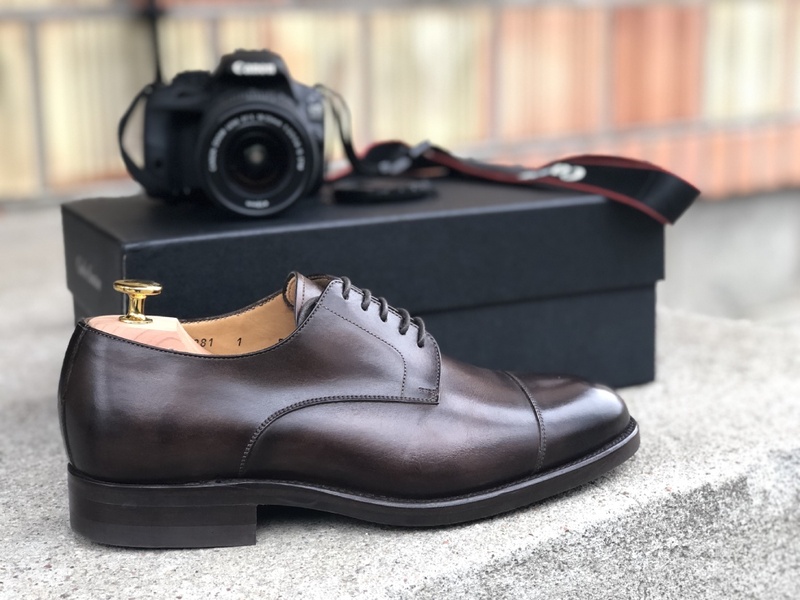 If you are looking for a shoe for any occasion, from taking a Friday walk with the boys or closing that deal with an important client, the Carlos Santos 9381 Cap-Toe Derby in Coimbra is perfect for you. It represents one of the best investments for the money under 400$ with great quality and construction. Give it proper care and it will last you a lifetime. 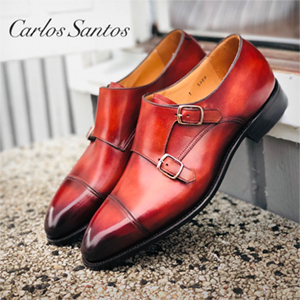 Comfortable out of the box with wonderful customer service, there is no better proof than me owning four pairs from Carlos Santos. I catch myself looking down from time to time, seeing how shiny and dashing they look. They make me feel like I am wearing a pair of 1000$ shoes and like a million dollar man. I think you will feel the same too. This brings us to the end of the “Carlos Santos 9381 Cap-Toe Derby Review“. If you own a pair or think of buying one, why not leave a comment and share your opinion? You can also subscribe and let us know we do a good job too!